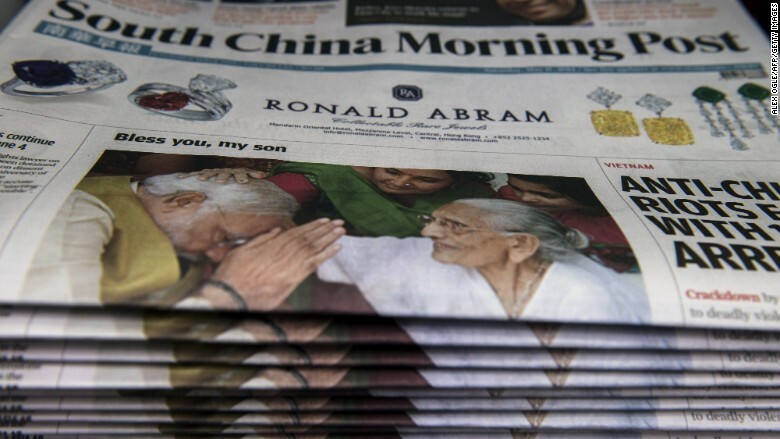 Alibaba is buying Hong Kong's main English-language daily, the South China Morning Post, for $266 million. Chinese tech darling Alibaba announced last week that it is buying the South China Morning Post, the leading English-language daily newspaper in Hong Kong, but offered scant information on the deal. On Monday, the SCMP Group released financial details in a filing to the Hong Kong Stock Exchange. Alibaba is buying the SCMP Group for HK$2.06 billion ($266 million), which is a tad higher than the $250 million that Amazon's (AMZN) Jeff Bezos paid for the Washington Post in 2013. In addition to the flagship SCMP newspaper, Alibaba will acquire the company's other media businesses: its weekly magazine, education unit, conferences, and all digital properties including mobile apps and two Chinese websites. The deal also includes a portfolio of magazines published by the company, including HK Magazine, and the local editions of well-known media brands Esquire, Elle, Cosmopolitan and Harper's Bazaar. Last month, the SCMP said it would begin printing the International New York Times for the mainland China and Hong Kong markets starting in February 2016. But the firm didn't specify Monday if this particular agreement would fall under Alibaba's buy. The buyer is an investment holding company that is a direct subsidiary of Alibaba Group. Alibaba (BABA) shares tumbled 5.5% on Friday after the deal was announced. The company has lost 15% since its record-breaking debut last year. The deal remains subject to regulatory approvals. SCMP's board "believes that the future of traditional publishing is an uncertain one and believes that the value of the media business lies in the rich digital media content," according to the exchange filing. "It is likely that a new media operator ... will be able to unlock greater value from the content and brand than a traditional media business such as that operated by the Group. The SCMP has long struggled financially -- profits have dropped for the past three years, while print circulation has also dipped. Shares of the firm have been halted since February 2013, and the company said there are no immediate plans to resume trading. The newspaper group printed its first issue on November 6, 1903, and was publicly listed in Hong Kong in 1971. Media tycoon Rupert Murdoch purchased a controlling stake and privatized the firm in 1987. Murdoch relisted the company in 1990 and sold most of his stake to Malaysian billionaire Robert Kuok in 1993. While SCMP's core business has primarily been in media and publishing, the company is also a major real estate investor in Hong Kong. SCMP Group owns four investment properties, which earned a rental income of about HK$28.7 million ($3.7 million) in 2014, according to the filing. The company plans to continue with its property investments after selling off its media businesses.